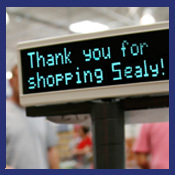 If you are interested in joining the Sealy Chamber of Commerce or even if you have already become a member, paid your membership, and have been explained all of the great programs the Chamber does for the community to help make Sealy a great place to live and work, but you may be asking yourself…"What’s in it for me?" Well, plenty. Here are some of the benefits available to you as a chamber member. through the Sealy Chamber of Commerce’s new Banner Ads. distributed in our local Sealy Newspaper. • Social Networking – Facebook & Twitter. of local businesses, professionals, services, and other establishments. It’s like having an unlimited full-time staff working for your Company. Sealy Chamber of Commerce members are afforded the opportunity to network with fellow members who are then able to send and receive valuable business referrals. You become part of a “customer referral service.” If you need political clout, the Sealy Chamber of Commerce can assist you in contacting Local, State & National officials. Grand Openings and Ribbon Cutting Ceremonies are available to members who open new business or those members who are re-locating/expanding their existing business. Discover the benefits of belonging to the Sealy Chamber of Commerce! The Sealy Chamber of Commerce is a business organization created to provide the leadership to enhance economic growth for the betterment of our members while working to provide a better quality of life for the Sealy Community and its surrounding areas.